Painted in oils by Gordon Frickers measuring 76 x 101 cm (30″ x 40″), available. Part of the proceeds will go to the British Olympic Youth sailing Scheme. 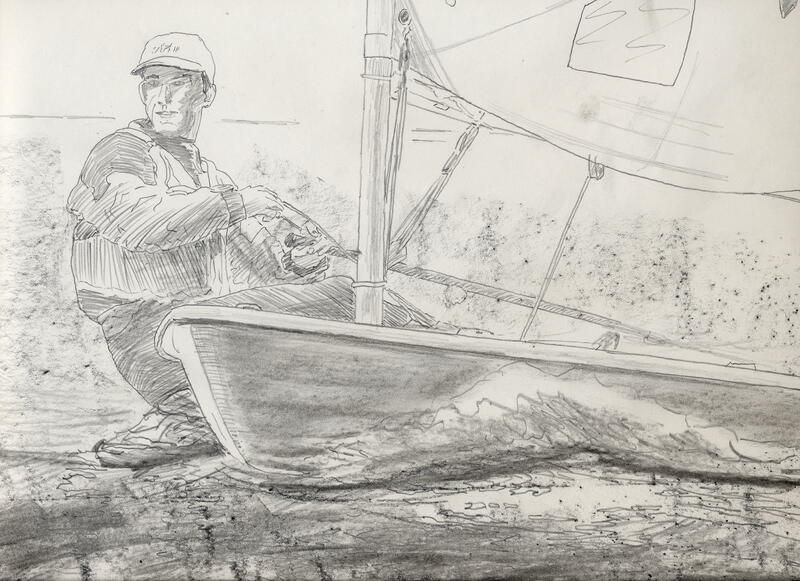 Ben Ainslie, sailings most decorated Olympian, America’s Cup victor etc, generously gave his full co operation with this painting. We worked closely together, much helped by members of Restonguet Sailing Club in particular Eddie Shelton, Ben’s original coach. Ben Anslie, a fine sailor, great personality, an inspirational talent which he continues to live up to thus this marine portrait painting to be has to be a very real collector’s item. 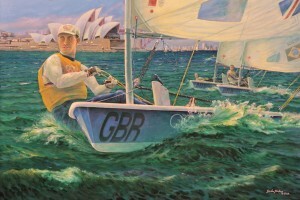 Ben Ainslie and I co-operated closely to produce this unique Olympic Games action portrait of Ben Ainslie at the Sydney Olympic Games sailing a ‘Laser’on his way to win his first of 5 gold medals for sailing. 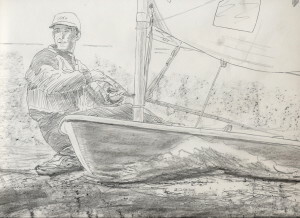 Ben Ainslie was elected ISAF World Sailor of the Year in 1998, 2002 and 2008. Ben has since then distinguished himself in many ways and acquired a well earned knighthood, my sincere congratulations Sir Ben Ainslie. Ben Ainslie and I received support and assistance on the water from members of Restronguet S.C.
Our particular thanks to all at RSC in particular Eddie Shelton who trained Ben to win his first world title in the Optimist class. 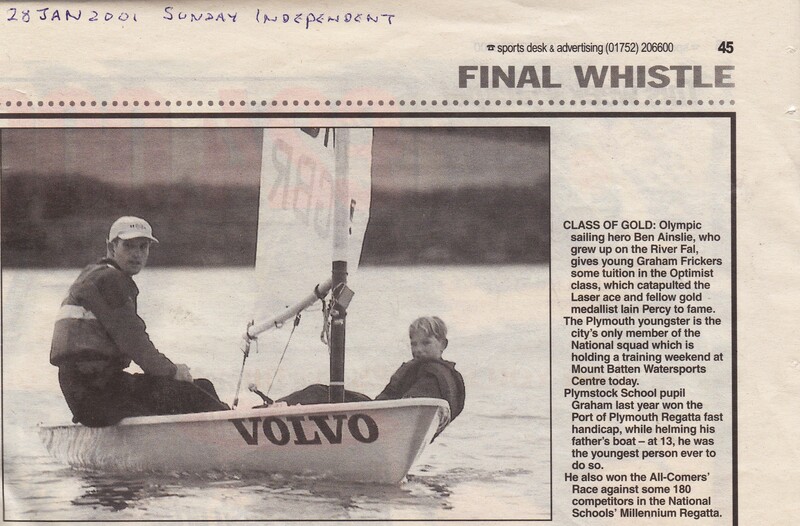 I lived 5 years at Falmouth and much longer in Cornwall, my son and daughter trained with Eddie Shelton at the RSC, in part there, I an RYA sailing Instructor and racing coach. Ben Ainslie continues to build a distinguished career; his Laser has ‘retired’ to Falmouth Maritime Museum, an outstation of the National Maritime Museum, Greenwich, London. 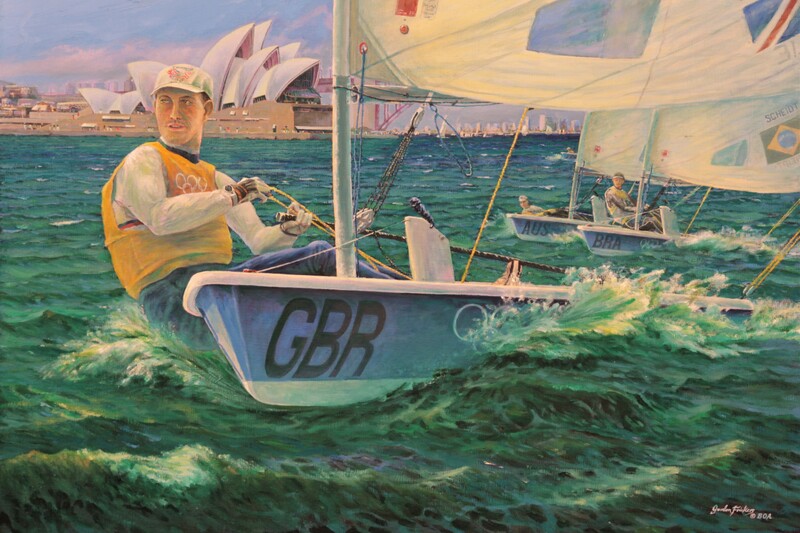 Proceeds, a generous percentage, from the sale of painting will be donated to British Olympic Squad and the British National Youth Sailing Squad Scheme via the Royal Yachting Association.